If you find any signs of a termite infestation, you will need a pest control as soon as possible. With more than 20 years of experience, Varsity Termite and Pest Control in Chandler is the termite company that has the knowledge and the skill required to apply the termite treatment needed in your house. Our positive reviews with Google, Yelp and our A+ rating with the Better Business Bureau shows that we understand how important your home is for your family and pets. With a thorough termite inspection, we will find out what kind of termite treatment your house need. Termites never sleep, so there might always be a group of termites feeding on the wood inside your house. These little creatures are one of the worst pests to have in your house, so to deal with them as fast as possible, you can contact a professional termite company like Varsity Termite and Pest Control in Chandler. 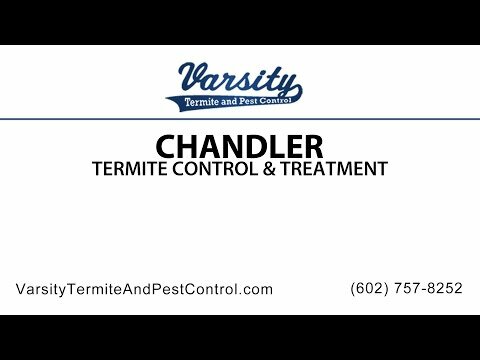 Varsity Termite and Pest Control is always ready to assist you with the best Chandler pest control service. It has been said that there are only two kinds of houses in AZ, those that have termite problems and those that will. But does your property have to experience termite devastation or be targeted for termite control in Chandler? It’s Not If You’ll Need Chandler Termite Control, It’s When! Chandler homes and businesses are being slowly eaten away by more than just the wind, rain and other elements. Before human settlements arrived in the Phoenix Valley and Chandler, thousands of termites survived on the Desert floor. Termites thrive when provided with a source of moisture, shelter from the hot desert sun and an endless supply of fresh food … your home! With the influx of the human population, termite infestations in Chandler are commonplace. The 95,000 plus households in Chandler are more than enough food for termites to live off for years. Here at Varsity Termite and Pest Control we utilize our years of experience in the Chandler area in providing the most effective termite inspections and treatment. Termites are an extremely invasive species of insect that nobody wants near their home. That’s why for years, customers have relied on Varsity Termite and Pest Control to eliminate the problem before it even starts. Varsity Termite and Pest Control is a family owned and operated company that prides itself on our vast number of customer referrals from a satisfied client base. For over 21 years we have been eliminating pests in Chandler and it is our mission to provide the same level of service to you. So don’t wait, call Varsity Termite and Pest control at 602-757-8252 or visit us online at varsitytermiteandpestcontrol.com, today. A major calamity can be avoided by having a termite inspection done by a termite control company in Chandler. Make no mistake, termites are a big problem, to the tune of five billion dollars a year.. The reason termites can pose such a threat to property is largely due to their dietary habits as well as their social organization. To start off, even though termites are members of the cockroach family (order Blattodea), it is only about 10% of the 4,000 different species of termites that can be categorized as pests and are the ones you want to call a Chandler termite control company about . In fact, in tropical areas some termites even serve a vital ecological purpose. Termites eat debris and enrich the soil. Termites that build nests near your home, however, are something to really be worried about. Let’s say your house has little to no wood in its construction, so you are not worried about termites.} Unfortunately, it is not that simple. In an ideal world, termites would only eat one variety of wood, and we could build our buildings appropriately. All one would have to do is build their home out of materials that termites wouldn’t want to eat. Termites don’t confine their diet to just wood however; they also can eat plastics, paint, and silicone adhesives. Sometimes, termites might not eat non-wood materials such as these, but they will also sometimes use them to build nests. The result of an infestation of termites is ultimately damage to wooden structures. Owing to their diet, namely wood and wood products like cellulose, many termite species damage buildings that are unprotected, as well damage or even destroy other wooden structures. In addition, as they can also often remain concealed and eat wood from the inside, their presence is often not detected until its too late. It is a far better idea to get on the phone to a termite and pest control service in Chandler and have a termite inspection done to stop the problem literally in its tracks. In Chandler, Varsity and Termite Pest Control has the fastest response against any pests that haunts your home. With just a quick call, we can inspect and identify the type of pest in your house, and know what kind of control treatment you need. Termite queens can lay an egg every 15 seconds, making termites one of the pests with the fastest reproduction rate. To eradicate and prevent a termite pest in your home, you can contact us for the best termite pest control. A scorpion’s ideal environment is the dry and desert one, so that makes Chandler a good home for them. They are little and carry a venomous sting that can hurt your family and pets. Give as a call for the best scorpion pest control and scorpion home sealing in Chandler. Guaranteeing to be the best termite control company in Chandler, we provide the security and safety your family needs from all the bugs and little animals that can infest your home. Varsity Termite and Pest Control’s owner Tony Kaufman has more than 20 years of experience and knowledge in termite pest control, guaranteeing that his company is more than capable of dealing with them in a fast manner, making you not having to worry about pests again in a long time. As soon as you find any evidence of termites living in your home, don’t hesitate to give us a call. As an honest and reliable local pest control company, Varsity Termite and Pest Control understands how important is to keep your home safe. Our termite treatment products are made with organic and natural materials, so when we deal with your pest control, it won’t affect your family or your pets. We also frequently utilize the Sentricon termite elimination system to combat various types of subterranean termites. Varsity and Termite Pest Control is your best choice in Chandler. You can reach us at 602-560-6021 to coordinate a thorough inspection and to know what pest treatment is needed as quickly as possible. Which Costs More? Termite Control in Chandler, Or Repairing Termite Damage? Termites are widely regarded as pests because of the level of damage they can cause. For example in India, termites ate the equivalent of roughly four thousand US dollars in April of 2011. Because we like the same temperate climates, termites and humans often clash. Termites can cause both severe property damage to the tune of several billion dollars a year. Termites also produce large amounts of greenhouse gases like methane.